As Make puts it, the atomic clock is old and busted. The quantum-logic clock from National Institute of Standards and Technology, keeping time 100,000 times more accurately than its predecessor, is definitely the new hotness. 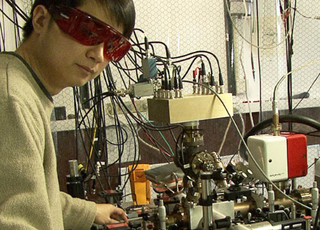 The quantum clock, developed by physicist Chin-wen Chou of the NIST, keeps time by measuring the energy of a single aluminum ion with UV lasers. It loses one second every 3.4 billion years, compared to the cesium fountain clock which loses a second every 100 million years, and upon which the current international standard is based. In fact, the new quantum-logic clock is so precise that Chou's team can't even measure it, as the current definition of a second is based on the prevailing cesium clock.